BACKTOFRANKBLACK.COM: Future Back to Frank Black Staffer? 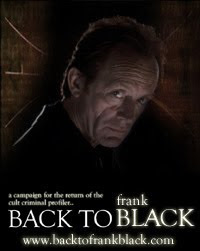 One of the amazing things about working on this campaign to bring Frank Black back to the big screen is that we get to meet fans of Lance Henriksen from all over the world. At last count, there have been people coming to the site from over 30 countries! This definitely shows that Millennium and Lance Henriksen have a worldwide appeal. FOX, are you reading this? Right now, Back to Frank Black has a complete staff for the first time and we are running like a well-oiled machine, but let's not forget that we all have lives outside of the campaign. That's why it is with great pleasure that we present a future staff member. In the video clip you will see below is the lovely Juliet Balmean. She is the daughter of Back to Frank Black staff members Max and Christina. At just 17 months she sits in front of the TV and, although some very creepy images of the Pumpkinhead monster appear on screen, she just takes it in stride. One of the cutest things we have ever seen! Please join us in thanking Max and Christina in letting us share this great clip with all of you! 2 Responses to "Future Back to Frank Black Staffer?" Needles to say Juliet is Badass!!!!! Like Uncle Lance! That is priceless. And adorable. What can you say? Pumpkinhead is mesmerizing!